Just a reminder today is the last day to use the coupon code 20OFF20 to get 20% off your order of $20 or more. I also just added a sundress from last year’s summer sew-along that’s finally been resized and fits a variety of sizes like Paola Reina/ Wellies/Sasha/AG/Maru. A new 1950s collection and contest winner! 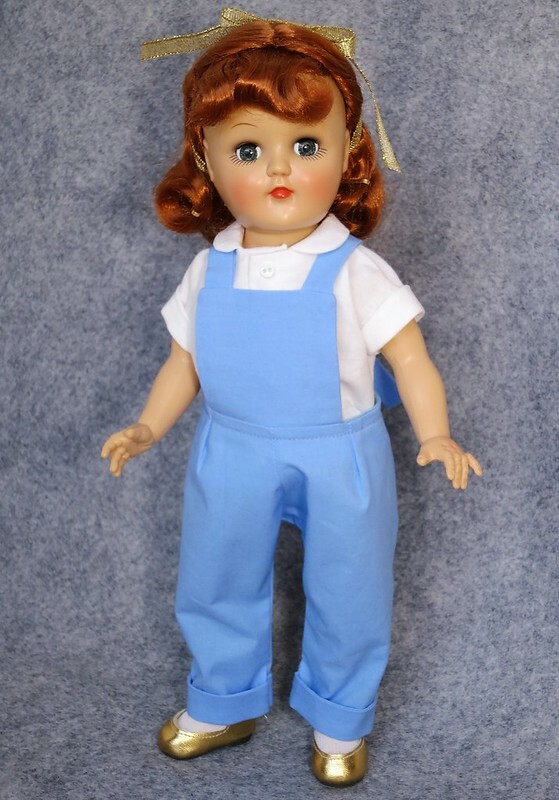 If you weren’t able to join in the 1950s sew-along for 14″ dolls because you didn’t have one, guess what? 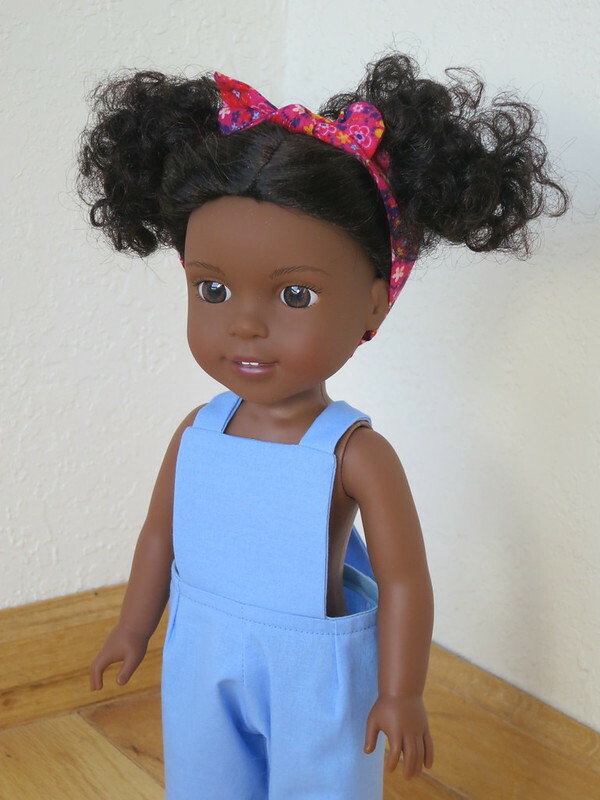 A new collection for 18″ dolls is available! One of the reasons I love embroidery is that it’s an easy way to get a perfectly “period correct” look without having to hunt down vintage print fabrics. When I did my previous 1950s collection, there was not a lot of embroidery included. Embroidery on clothing was somewhat less popular at that time than in previous eras, partly due to the ready availability of cheap trim and the styles themselves, and maybe partly due to the increased number of outfits one would have, thanks to washing machines. A 1930s mom might be willing to spend much longer embroidering a few dresses that her daughter would wear over and over than a 1950s mom whose daughter had far more of them. With a lot of searching antique and resale stores and hunting online, I came up with a nice selection of outfits from the era that did include embroidery and am thrilled to share them with you! Although the designs are available in .pes format for embroidery machines, in many cases I chose ones that would be quick and easy to hand embroider too, for example, the slip and dressy coat that are mainly just French knots. If you’re lucky enough to have a stash of vintage fabric, or even a nice selection of checks/dots/plaids, you can also forgo the embroidery completely! One thing that is the same about this collection is a focus on fashions moms were sewing for their daughters, rather than the easier doll patterns that were available at the time. 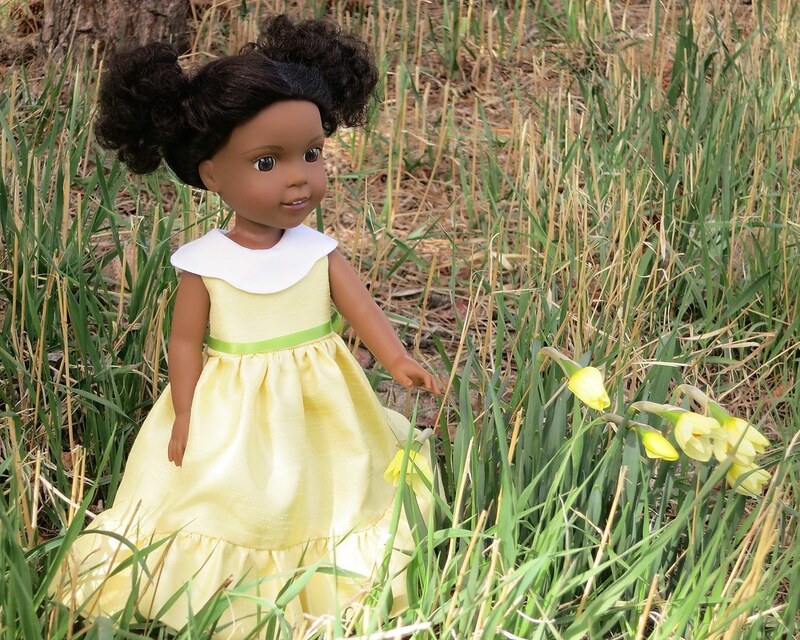 This makes the dresses a little more challenging to sew, but lets you dress your doll like a mid-century little girl, rather than a doll! 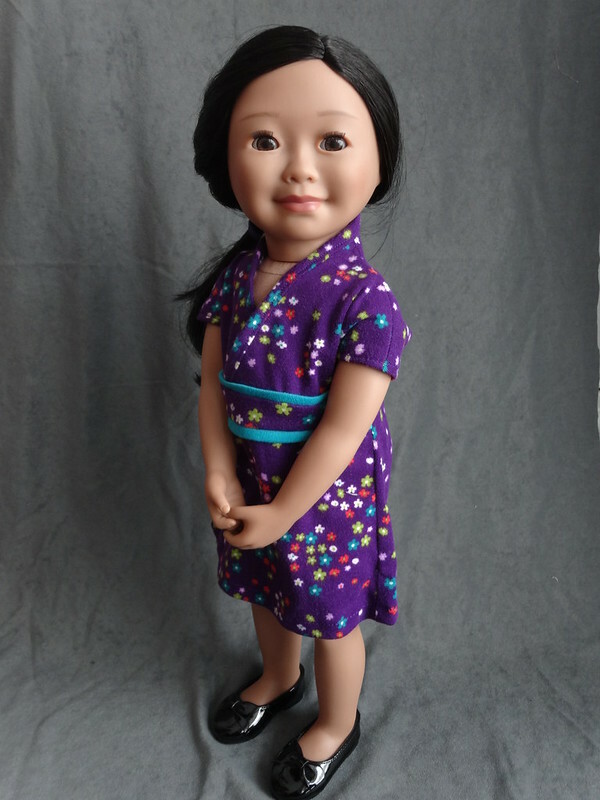 If you’d prefer 1950s outfits for a 16″ doll like Sasha, check out this collection! Until Sunday, use the coupon code 20OFF20 to save 20% on any purchase of $20 or more!! This is my favorite time of year! Birds are singing and flying around busily with twigs and bits of fluff for their nests and every little flower pushing its way up out of the dirt makes me smile. Every time I go for a walk I keep taking deep breaths to smell the beautiful blossoms on all the bushes and trees. This week’s dress celebrates daffodil time! It’s such a simple pattern, it seems to cry out for lace and embroidery and trim, but in this case I stuck with the simplicity of a daffodil – just some petals and a ruffle. The winner will be chosen at random by a number generator and announced next Thursday! There is NO other way to enter. Do NOT try to enter this contest by emailing me photos or ask me to enter you any other way. You must post your photo(s) on the flickr page and then submit the link(s) in the form. Don’t feel like going through all that work to enter a contest? The new 1950s AG collection will be available on etsy next week! b) I’ll have some more fun 1950s crafts besides the Betsy dresses! This week, we’re back to our scheduled sew-along of adapted Butterick 7973. For the bodices and blouse so far, I had to make a lot of changes for a nice fit. 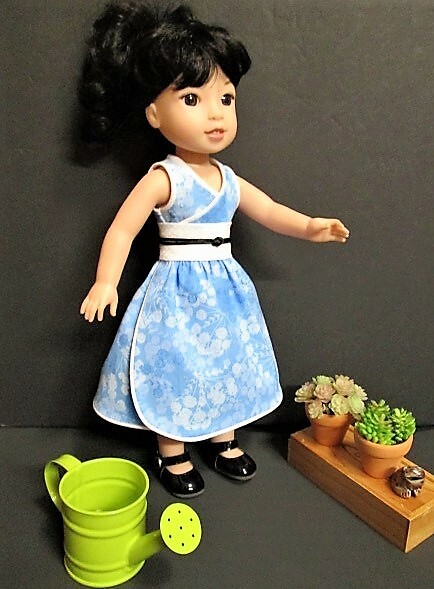 This week’s pattern includes both the original and some notes and altered pattern pieces to adapt for Wellies and other dolls with a similar torso. As a reminder, their measurements are similar but proportions/shape are different, especially at the waist. So more fitted pants were difficult to have fit both equally well. No, it’s not Thursday or summer yet, 😉 but I’m not on schedule to finish this week’s outfit and get pix/pattern done in time and got a little sidetracked by brainstorming ideas for the summer sew-along. So there may not be a Thursday pattern post this week, but don’t worry, at least two more outfits from this series are on the way, just a little delayed! If you’re new to this concept, the summer sew-along is a favorite of many here on the blog because it follows a theme, sometimes introduces new skills (like sewing with knits, making sandals) and sometimes also ends up with a coordinated wardrobe. People share their ideas on flickr and inspire each other to do more creative things. Speaking of the SSA on flickr, I went on today and found two recently posted pix made from patterns from last year and the year before! What will it be this year? Even though you won’t see it until June or so, my planning and pattern drafting has to start now! I thought I had made up my mind after lucking into a HUGE stash of actual vintage Betsy McCall paperdolls and ads for original Betsy dolls. If you don’t know what they look like, you can see online versions here. It seemed like it would be fun to choose summer outfits representing different years from the paper dolls and make them for the Wellies/Toni, since that size seems to be a favorite at the moment. And THEN I saw Betsy’s bunny beach cover up (below left). If you are around kids, you might know the animal “theme” is very popular at the moment in kids’ clothing, from hats to backpacks to hoodies with animal ears/dinosaur scales/bird beaks/etc. In fact, my Wellie owl cape is THE most-requested custom order ever, and even the Wellie Wisher Willa comes with little bunny ears. In the Japanese doll world, animal themes have been popular for quite some time too, (for example, on Blythe above right) and I just figured it had finally made its way into kids’ clothes, so to see Betsy’s bunny beach cover up from 1951 made me think it’s not just a trend, it’s a great idea that’s been around for a long while! Since both options sound great to me, I’m going to leave it up to you readers. We’ll be using ~14” dolls as models, so Wellies, Hearts for Hearts, Toni, etc. will be able to wear these clothes. Betsy McCall paper doll outfits from the 1950s (yes, one of the weeks would be that bunny one, the rest would be regular summer clothes like swimsuits, dresses, etc.) If I get super motivated, I might try to make Wellie paperdolls with the outfits, but no promises about that! Please vote below – poll closes at the end of this week!